JACKSONVILLE – The home team wanted to put the pedal to the metal for a full 32 minutes Thursday night, refusing to take its feet off the accelerator until the final buzzer went off at the end of the game. Jacksonville did just that, using suffocating defense that helped it get out in transition for easy buckets. It scored the game’s first 12 points and never looked back en route to a 66-40 victory over Hokes Bluff in the semifinals of the Class 4A, Area 10 tournament. 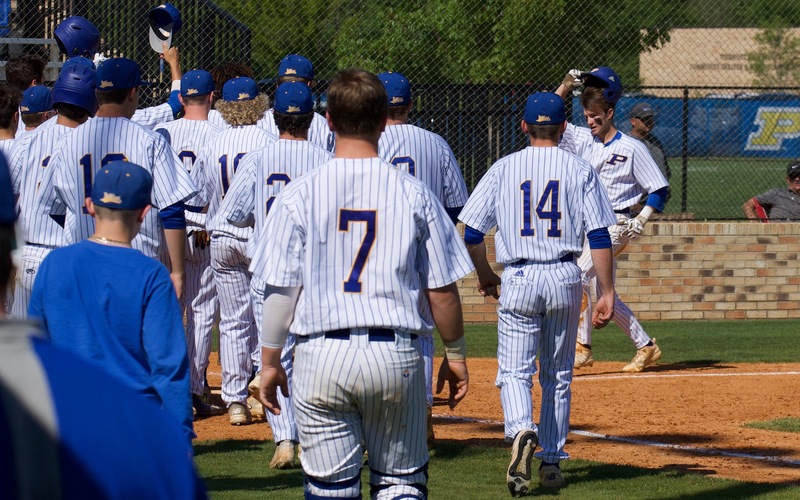 The Golden Eagles (14-11) will now play Cherokee County for the area title Saturday. Both teams are guaranteed spots in the sub-region round of the tournament; the winner will host second-ranked Area 10 runner-up Talladega, while the loser travels to Anniston. Jacksonville bullied Hokes Bluff (16-12) for most of the evening, coming up with eight steals and forcing the non-golden Eagles into 17 turnovers. Jacksonville did the majority of its damage on the offensive glass, outrebounding Hokes Bluff 41-31 for the game and hauling in a staggering 22 offensive boards for 13 second-chance points. Junior Donavon McCain and sophomore Omarion Adams pulled down five offensive rebounds apiece, with McCain coming away with a first half double-double and finishing with 12 points and 13 rebounds on the night. Adams finished one rebound shy of a double-double himself, matching McCain’s 12 points. 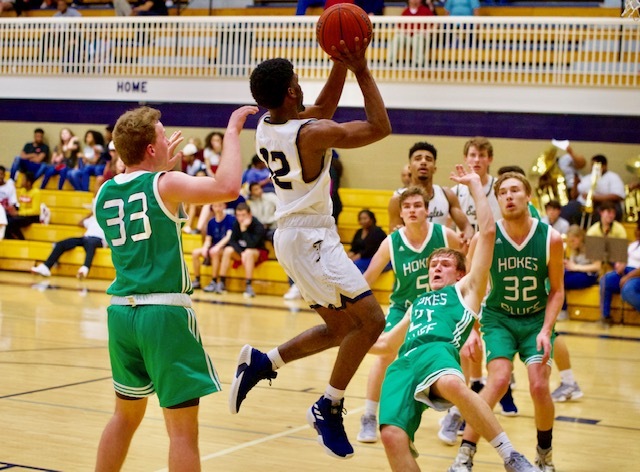 The Golden Eagles were never seriously challenged, but a pair of 3-pointers by Hokes Bluff senior Donovan Greaves late in the first half cut their lead to 33-16 at halftime. Greaves was the lone bright spot for Hokes Bluff, pouring in 23 points on 9-of-20 shooting from the floor. The other Eagles shot just 33 percent from the field, struggling to find easy looks against Jacksonville’s relentless pressure. Even with a 17-point edge, Hunt preached in the locker room that the second half was a brand new game, and that his team should play like the score is tied. He wanted to avoid a second-half snooze that allowed Hokes Bluff to crawl back into the game, hoping to leave no doubt by the time the buzzer sounded. “I wanted to keep putting the throttle down,” said Hunt. 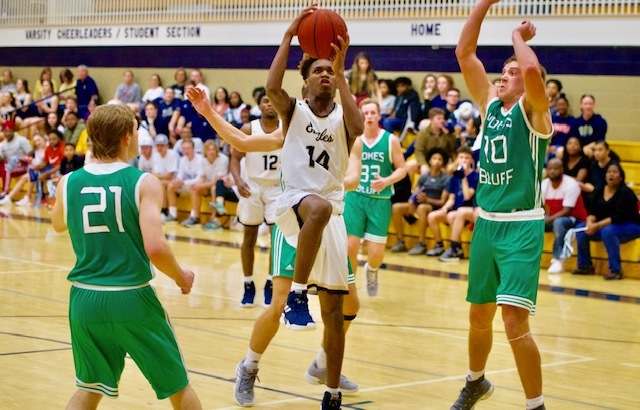 With the pedal nestled safely on the floor, the Golden Eagles didn’t allow Hokes Bluff to get closer than 15 points in the second half as they continued to force mistakes and rolled to a lopsided victory, their third win over the Eagles this season. With McCain and Adams doing the dirty work inside, it freed up junior Yessman Green to get some open looks. Green scored eight first quarter points, helping Jacksonville build a big early advantage and finished with a team-high 21. On to the area title game, Jacksonville and Cherokee County split the regular-season meetings between the two, with the Golden Eagles coming away with a 17-point win in their last matchup. The Warriors have reeled off seven straight wins since that defeat. HOKES BLUFF (16-12) – Robert Greaves 9-20 2-2 23, Matthew Johnson 2-4 0-0 5, Hayden Lipscomb 1-3 2-5 4, Payton Lemons 1-3 0-0 2, Cory Cross 1-1 0-0 2, Braydon Hill 1-2 0-0 2, Colby Latham 1-1 0-0 2, Tucker Marsh 0-1 0-0 0, Caleb McGinnis 0-4 0-0 0, Jackson Millander 0-0 0-0 0, Dylan Teague 0-1 0-0 0, J.P. Fairel 0-0 0-0 0, Ethan Whitcomb 0-1 0-0 0. Totals 16-41 4-7 40. JACKSONVILLE (14-11) – Yessman Green 7-13 5-11 21, Donavon McCain 5-11 2-6 12, Omarion Adams 5-12 1-5 12, Jay Davis 4-7 1-2 9, DeMarien Stewart 1-4 4-4 7, Nathan Barnwell 1-3 1-1 3, Hudson Harvey 1-3 0-2 2, Carter Landers 0-1 0-0 0, Luke Jackson 0-0 0-0 0, Kyrie Maynor 0-3 0-0 0. Totals 24-57 14-31 66. 3-point goals: Hokes Bluff 4-19 (Greaves 3-12, Johnson 1-3, Lemons 0-2, Teague 0-1 Whitcomb 0-1); Jacksonville 4-16 (Green 2-6, Adams 1-3, Davis 0-2, Stewart 1-3, Maynor 0-2). Rebounds: Hokes Bluff 31 (Lipscomb 9); Jacksonville 41 (McCain 13, Adams 9). Fouled out: Lipscomb, Hill. Total fouls: Hokes Bluff 22, Jacksonville 13.